I am finally making my own Creation - Fairygemlove into a Norn breed, and this is what I am working on together with my sister Norngirl! 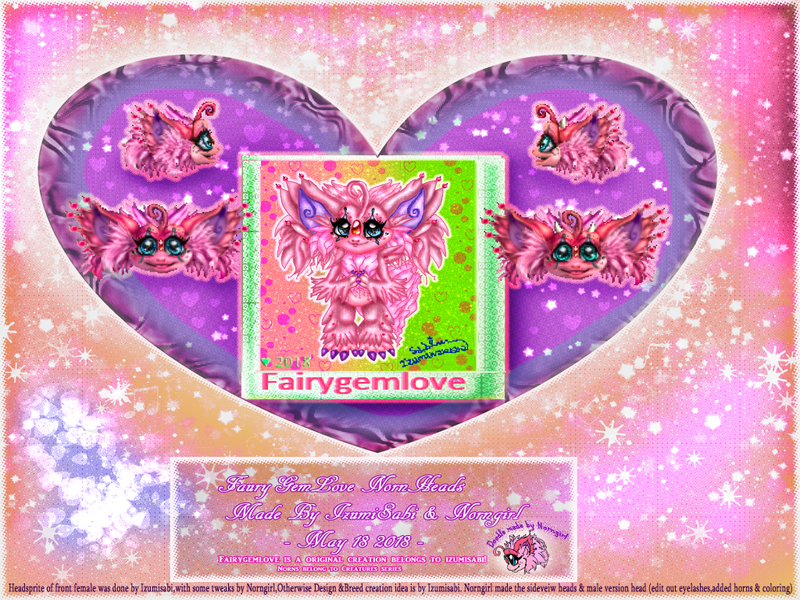 It's a preview on the head sprites we made and full size of my original artwork of my original creation & character, Fairygemlove, who im making a breed of. The female is supposed to look similar & made after my own creation, as you can see on the picture! I made the front female head, but my sis tweaked and changed some things. & slight change in coloration hue and eye color. She also made the sideview head sprite of both gender by herself. font text is made by my wonderful sister Norngirl. I wanted to make this as a breed at some point, already had some plans. I posted up my small preview image of Fairygemlove before here on CC, to get to know if anyone was interested. Anyhow,this is the preview of how the head sprites will look like! Hopefully we will be able to finish it together to make it into a complete Norn breed. Please do comment what you think of it! Fairygemlove © me (IzumiSabi) - she is my own creation! Quickdoodle of the female head © my sis Norngirl. Awesome! I love that even the males are still brightly colored and feminine, it's very cute!